And now, for the cheapest full-frame digital SLR there is, yet! Suddenly, all the lenses in the top shelf can be used. 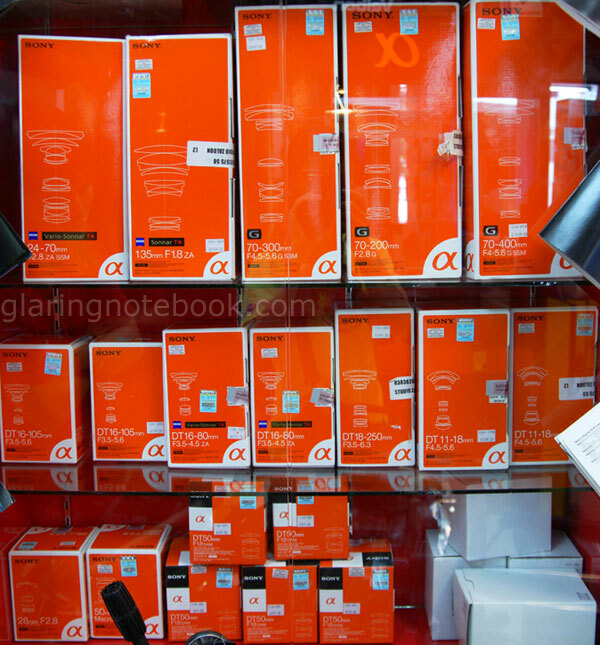 (Hmmm, the Carl Zeiss 16-35mm F2.8 SSM is missing from this…) This is the poisonous Studio Zaloon in Pudu Plaza. 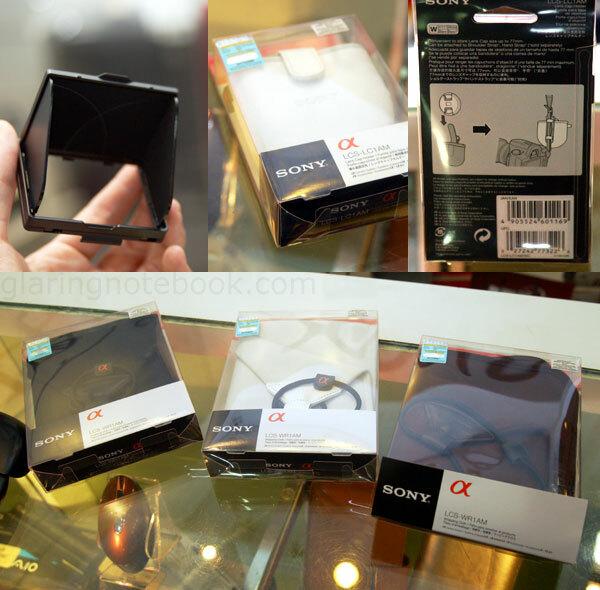 – the A850 is probably going to be priced very, very nicely, knowing Sony! Everything else is the same! 24 megapixels in a 35.9mm x 24mm full-frame sensor, weight, size, button layout, DRO Level 5, Intelligent Preview, user-changeable viewfinder screens, FM500H battery usage, CF and MS card slots, it’s all the same. There was another link where you could order service parts for the A850 – the only differences were the circuitboard and viewfinder assembly. So, in theory, could you buy an A850 and upgrade the circuitboard and viewfinder assembly? Maybe! What’s the deal with a 100% viewfinder? The benefit of a 100% viewfinder is that what you frame is what you get. While I have gotten into the habit of framing exactly, 98% is not a big loss and you can still crop unwanted edges out of a 24 megapixel file with minimal loss. If you put one camera to each eye, you can see the difference in size quite obviously. The Sony RMT-DSLR1 infrared remote controller is not so useful for studio work – you don’t get MLU using the infrared remote. You can’t use Drive mode in 2 seconds + infrared remote control, unfortunately. That’s why I bought a shutter release cable and use situation #1. It is also unfortunate that when the remote’s 2 second button is used, there’s no mirror lockup before waiting 2 seconds! I don’t understand why it was programmed that way… if mirror lockup happened before waiting 2 seconds, it would be the best of both worlds. I do hope that they improve high ISO performance in the A850, and bring those new methods as a firmware upgrade to the A900. And now, for more generic geeking. 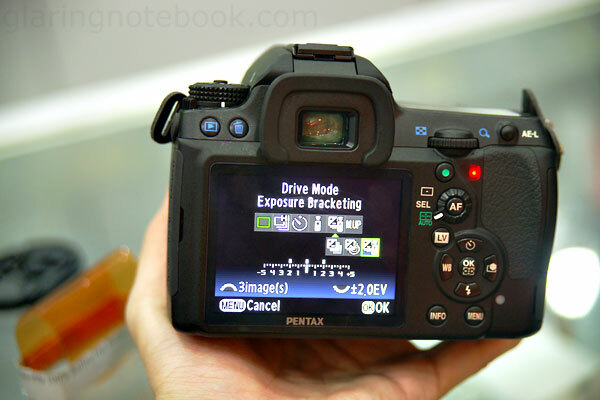 So there’s also the Nikon D300s and Pentax K-7 in the high-end APS-C category. Both are extensively decked out in features. 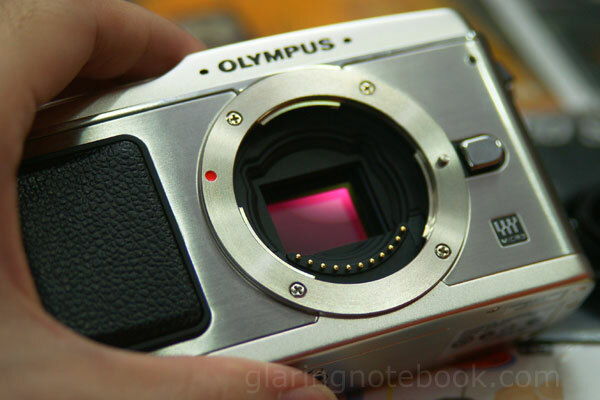 Then there’s the Olympus E-P1. It’s surprisingly heavy. I guess I preferred the prototype’s design. Still, very nifty! Focusing with the 14-42mm F3.5-5.6 was so-so; it would often do a focus rack before actually catching focus. I don’t know how this would fare in real-life usage. Though, the collapsible design of the lens was very cool! The Olympus 17mm F2.8 pancake is certainly nice in size, but not my preferred range nor aperture – the upcoming Panasonic 20mm F1.7 pancake for Micro Four-Thirds would be much preferred. 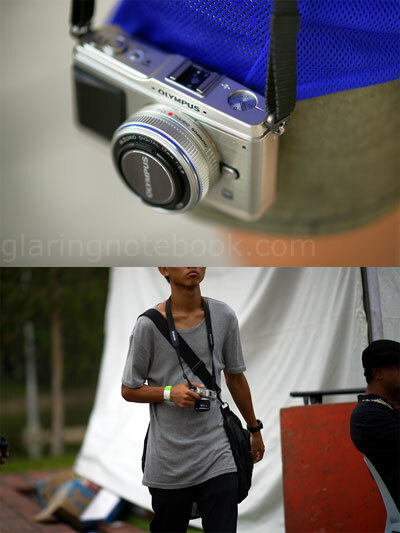 Both cameras spotted at Urbanscapes 2009! And here’s more Alpha accessories – top left is a new SH-L1AM LCD shade for the A230/A330/A380; top-middle is the LCS-LC1AM lens cap pouch; top-right is how you can put the lens cap pouch around your strap (ingenious!) 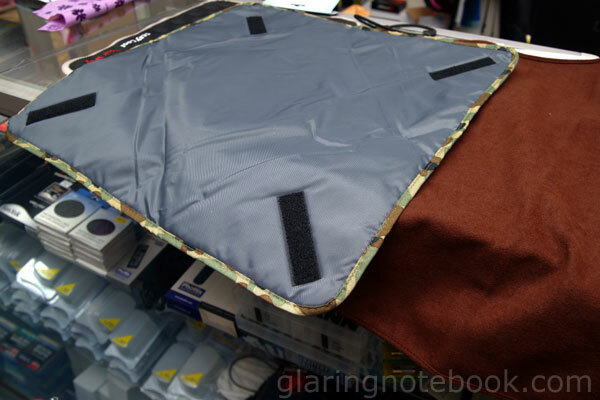 and below are the 3 colors that the LCS-WR1AM wrapping cloth comes in. 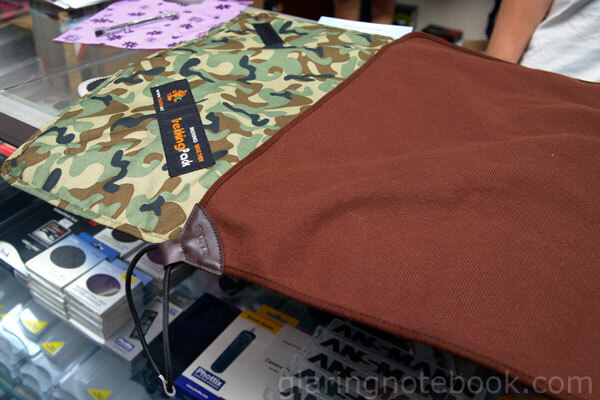 …and comes with velcro instead of an elastic band. It folds down to a size bigger than the WR1AM. Despite its obvious benefit of being more padded, it just could not hold my A900 + Minolta 24-105mm F3.5-4.5(D) + HVL-F20AM flash. It wouldn’t even fit, without the tiny flash… so this wrapping cloth was specifically for smaller, shorter camera bodies. Still, if it tickles your fancy you can try it at Digitalsmania, in Pudu Plaza. Inside: A Sony A700 + VG-C70AM battery grip + Tamron 17-50mm F2.8! 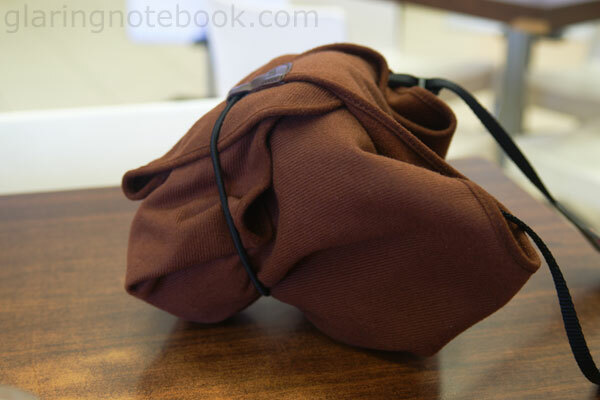 The F58 can go in its own belt pouch. I will not bring any other flash, just camera, standard or wide zoom and F20. I’d use high ISO and bright apertures anyway to get the ambient light of the party in. It is likely I will use DIRECT flash and blend in plenty of ambient light to reduce the harshness. So, power is not an issue for me. If I am covering an event and I am paid to take photos, I am obviously not going to use the F20! The F58 is the man for the job. So at F5.6 ISO400, the range at full 1/1 power, direct, is 40 meters / F5.6 = 7.14 meters. When bounced we divide it by 2 and get 3.57 meters. I think that’s far enough for me, but I am not afraid to use ISO1600 so I get my 7.14 meters range. You can tell if the F20 fired full power; it does whirr like a F42. Used indoors you will never hear this happen. Can the F20AM be used on an A200/A700 to trigger off-camera flashes? Does the F20AM in wireless controller mode, contribute light to the scene? Is the F58 or F20 more powerful as a wireless controller in bright daylight? A300, A700 and A900, manual mode, multi-segment metering, 1/160s F22 ISO100. Experiment was conducted from 1200-1230 hours +800 GMT. Minolta 24-105mm F3.5-4.5(D) set at 105mm. F56 flash lying on ground set to 1/8 power, 85mm flash zoom, with full CTO applied to make it 3200K. It was a sunny day, but unfortunately there were clouds continuously passing, so the meter would go from -2 to 0 EV but never brighter than 0 EV. F20 set on DIRECT and TELE (50mm). I would attempt to shoot when the clouds went away, and the meter read “0”. 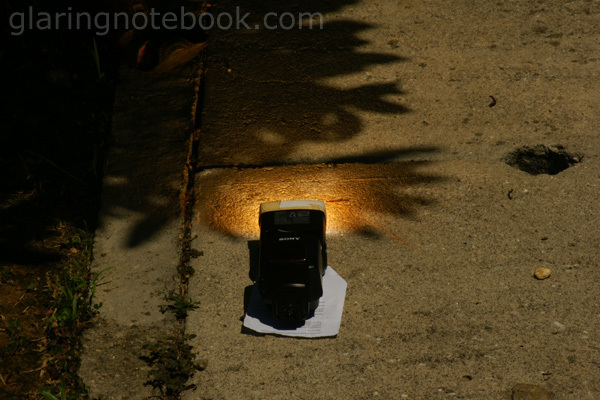 Neither the F20 nor F58 could trigger the F56 when the sun was this bright and shining directly on the F56’s sensor. When the meter dipped to -1 or darker, I could trigger the F56 using both the F20 and the F58. This picture might give you a representation. It was shot when the meter read -1 EV. So what was the maximum distance to trigger a F56, given that I have made it as challenging as possible? – the F56 is placed at a funny angle – I wouldn’t expect the flash sensor to do so well with detecting signals from below! Remember that you can shoot in bright sunlight and get better range than this because your off-camera flash won’t be lying down. These numbers are the worst case scenario! Your off-camera flash would probably have an umbrella to its own, and that would make it easier for it to detect the signal. When the sun moved a bit, the shadow of the tree actually moved over the F56 sensor, making it very easy to trigger at any distance! So I had to move the F56 flash back into the sunlight. In short, the F20 is just as powerful as every other pop-up flash, but the F58 when zoomed to 105mm has the extra advantage. I lay the F56 and F58 down on the ground, and did the same tests with the F20 in wireless controller mode on A900. The F58 triggered easier at greater distances than the F56. This was especially so when coming from above (for bouncing the F58/F20 on the ceiling this would be relevant) and from the sides (the right side of the F56 is more sensitive, given that the F56 sensor is on the right… but triggering from the F56’s left is pointless.) I guess it was easier when shooting from below, for the F56, but the F58 still won in range, about 1 meter more in range. However, when I put both flashes upside down, standing on their heads, and fired directly, both had absolutely no problems triggering. How far, I don’t know again, because my 24-105mm only marks 5 meters and the next mark is infinity! These kind of tests are tiring, and might be best done in a controlled environment with hotlights where you can control the power. And probably with a lens that resolves more distances on the focus indicator. The Zeiss 135mm F1.8 comes to mind but that only goes to a precision of 3 meters, 7 meters and then infinity. This entry was posted in Geek, Pictures on August 3, 2009 by 2konbla.